".. a beautiful film shot in the lush, verdant wilderness of Oregon"
"It's heartwarming and natural. My favorite film of the 2010 (Heartland Film) Festival!" Set on the banks of a wild river, The River Why is the story of 20 year old Gus Orviston , the Mozart of flyfishing (Zach Gilford, "Friday Night Lights"), who leaves his big city home in rebellion from his parents (Willam Hurt, "Into the Wild" and Kathleen Quinlan, "Apollo 13") to live in a secluded cabin on the banks of a wild river and do nothing but fish. Instead of finding fishing bliss, his desolation drives him on a reluctant quest for self-discovery. In the process he comes in contact with an assortment of eccentric characters who help him in his journey to adulthood - including a philosopher (Dallas Roberts, "3:10 to Yuma"), a reporter (William Devane, "Hollow Man") and a mysterious woman (Amber Heard, " Zombieland") who will change his life forever. Most of all, The River Why is a love story. The love of a man for the wilderness, and for a beautiful woman who comes to share it with him. 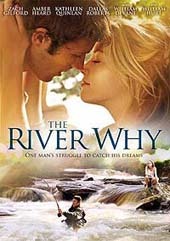 The River Why was released by Image on DVD on November 8, 2011, and later distributed on Netflix, Netflix streaming (May 2012), Hulu Plus and most other outlets. The viewer ratings have been terrific. The Netflix viewer rating system is instructive. As of January 2014, The River Why received ratings from 187,336 viewers with an average score of 3.5 stars (out of 5). "The film swept me away and is now on my list of favorite movies." "Never read the book, but if the movie was this good then the book should be sublime." "A beautiful film on so many levels and in so many ways." "The whole movie was like making love with all the colors, textures, smells, tastes, intensities, revere, surprises, sometimes questions..."
"It is perfect from beginning to end." "It's going into my all-time favorite movies! I will definitely be watching this one over and over again!" "My only complaint about this film would have to be that it had to end." "The movie was incredible. " "I would like to thank all involved with the movie, and the book, for helping my soul find some peace & perspective, at a time when it needed it most. If you haven't seen the movie, or read the book, I highly recommend it! " "Director Matthew Leutwyler effectively intercuts the lure and beauty of nature with the fine performances of his excellent cast. (Zach) Gilford is funny and appealing as the awkward Gus. Veterans William Hurt and Kathleen Quinlan are simply wonderful as his parents, creating memorable characters from small parts that could have easily tipped into caricature. William Devane provides some much-needed humor as a grizzled journalist and fishing enthusiast who befriends Gus. Amber Heard (literally miles away from her roles in ZOMBIELAND and PINEAPPLE EXPRESS) shines in perhaps the most pivotal role in the film, as the girl of Gus's dreams. This talented young actress has shown such range in her performances, stardom has to be just around the corner. " " ...the movie version of The River Why is really good. The film captured many of the philosophical underpinnings of the book. The book leaves the natural world to one's imagination. Whereas the movie brings the wonderful nature of an Oregon river basin alive. My advice would be to read the book and see the movie. " " A beautiful film shot in the lush, verdant wilderness of Oregon. " "This is lovely, understated filmmaking. Director Matthew Leutwyler wisely lets his camera and his actors, including the eye-popping Wilson River near Portland, (this is one of those stories in which the environment is a character) tell the story. When it looks this easy, you know it was hard work indeed...."
A benefit for the Atlantic Salmon Federation!! 6:15 : Cocktails and Smoked Salmon from ASF’s land-based closed-containment aquaculture project and is smoked by St. Mary’s River Smokehouses. Bill Taylor, ASF President, will bring remarks on this innovative project and ASF conservation efforts. • Admission is free. Donations to ASF’s land-based closed-containment aquaculture research are appreciated. Movie people are legendarily liberal and left-leaning, particularly when it comes to the environment. Greenlit puts their commitment to the test as filmmaker Miranda Bailey (executive producer of The Squid and the Whale) follows the production of The River Why, starring Zach Gilford (Friday Night Lights) as it attempts to keep an environmentally friendly set thank to the supervision of a "green" consultant.